At the time of his graduation, Ken Clark finished at Nebraska right behind hallowed Mike Rozier in total rushing yardage (3037 yards) as an I-back in the Cornhusker offensive attack (since surpassed). In 1988, Clark had a 256 yard rushing performance against the undermanned OSU Cowboys and his 1497 rushing yards in 1988 were second in school history (since surpassed). Ken over his college career would also finish as a two time Big 8 selection in 1988 and 1989. The Colts would tab him with an 8th rounder in 1990 and he’d step in playing on special teams a bit in a largely anonymous rookie season. Ken would help out any way he could in 1991, with a career high 366 yards on the ground, and 33 receptions. The Colts needed help at both tight end and running back- so he fit in as an H-back largely that season starting 7 games. The problem is he put the rock on the ground 4 times in 147 touches that season. 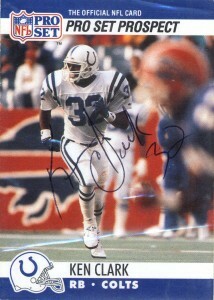 His 1992 would find Clark knee deep in the depth chart. 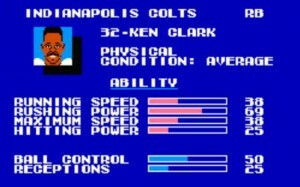 He’d only start 2 games but make the most of it with 134 yards and 5 receptions, and also do some kick return duty- but by 1993 Ken would be out of the NFL. In 2008 Ken would be inducted into the Husker Hall of Fame.